I've finally taken the time to video-record a patient suffering from laryngitis due to allergies both before and after successful treatment. Check out the video below of a singer who suffered from severe untreated allergies both before and after treatment (shown in the latter half of the video). Note the thick clear mucus on the vocal cords. 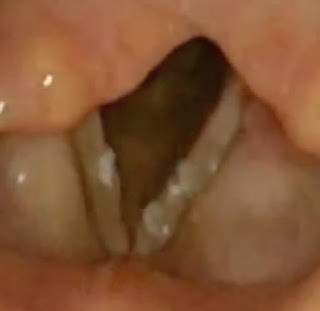 Several strong throat-clears were required to remove this thick mucus from her vocal cords (incidentally, she did have some mild right vocal cord swelling, probably triggered by chronic throat-clearing). Initially, treatment was daily mucinex (to make it easier to clear the thick mucus) and an oral anti-histamine to treat the underlying allergic cause. After 4 weeks, there was significant resolution of the clear mucoid drainage on the vocal cords; at that point only an oral anti-histamine alone was sufficient for maintenance. For more information on the different causes of laryngitis, click here.